The chemical 2-phenylphenol is an antifungal, antibacterial and antiviral agent that is commonly used as a preservative to fend off post-harvest storage diseases in certain crops such as apples, tomatoes and cucumber as well as peppers, citrus fruits and stone fruits. Likewise, the compound is used in the production of food seasonings. The compound is also utilized as a general surface disinfectant in various establishments including hospitals, poultry farms, veterinary hospitals and nursing homes as well as commercial laundries, food processing plants, dairy farms and barbershops. The fungicide belongs to the same chemical family as other harmful compounds such as breakdown products, salts and esters as well as isomers and other derivatives. However, an entry posted on the Chem Spider website cautions that while the chemical is traditionally used as both disinfectant and fungicide, the toxic chemical is classified as a highly carcinogenic agent and may lead to a vast number of adverse health effects. Exposure to the chemical — by inhalation, ingestion or skin and eye contact — is known to negatively impact the body’s overall health. According to the open chemistry database Pub Chem, inhaling the toxic compound is shown to cause severe respiratory tract irritation. Inhaling the hazardous chemical is also found to cause lesions in the airway. Additionally, the article notes that direct skin and eye contact may cause severe irritation. The entry warns that direct eye exposure may even lead to corneal damage. It is advisable that people exposed to the chemical wash their eyes with water for a few minutes and refrain from using ointment unless instructed by a doctor. The dangerous fungicide is found to affect the digestive system as well. The database entry cautions that ingesting foods and certain products containing 2-phenylphenol may lead to diarrhea, nausea, vomiting, and fainting. The article warns that the chemical is detrimental to the central nervous system too. According to the article, exposure to the disinfectant may trigger dizziness, weakness, central nervous system depression, and deoxyribonuclease inhibition. The antifungal agent is also known to cause dark urine, which may indicate a negative effect on the urinary system. The antifungal agent is also linked to other serious health risks including reproductive and developmental toxicity, neurotoxicity, and acute toxicity. An article published on the Pesticide Info website also reveals that the harmful compound affects water quality and is highly toxic to aquatic organisms. Likewise, 2-phenylphenol is highly combustible and releases irritating or toxic fumes in a fire. The chemical is also found to be an explosion hazard. The chemical is particularly harmful to both the respiratory and digestive tracts. Likewise, the hazardous compound is detrimental to the eyes, the skin and the kidneys as well as the reproductive health and the central nervous system. The chemical is characterized by its white and flaky crystals that have a mild, distinct odor. It is often used in crop preservatives, fungicides and disinfectants. Likewise, 2-phenylphenol is often used in the production of water-oil emulsions, vegetable wax, dish washing formulations and food storage paper. The hazardous compound is also used as laboratory reagent and is widely utilized in rubber production. Exposure to the hazardous chemical can be prevented by avoiding products containing 2-phenylphenol. 2-phenylphenol causes reproductive and developmental toxicity, neurotoxicity and acute toxicity. 2-phenylphenol raises the odds of respiratory tract irritation, lesions and corneal damage. 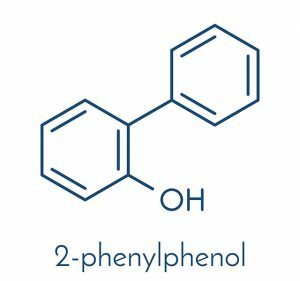 2-phenylphenol triggers dizziness, weakness, central nervous system depression and deoxyribonuclease inhibition. 2-phenylphenol induces diarrhea, nausea and vomiting as well as sweating, fainting and dark urine. 2-phenylphenol is particularly harmful to both the respiratory and digestive tracts. 2-phenylphenol is detrimental to the eyes, the skin and the kidneys. 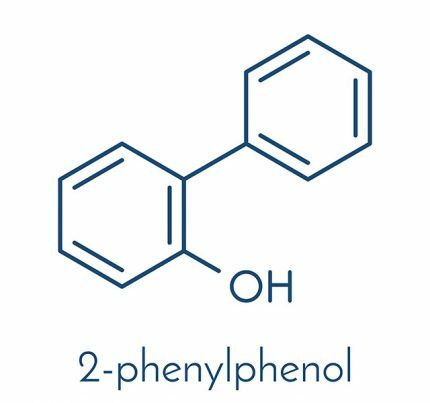 2-phenylphenol negatively affects both reproductive health and the central nervous system.